Goblin Jim is a Breton witch and the Shaman for the White Skin Goblin Tribe located in Goblin Jim's Cave. 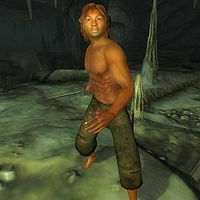 Although nobody will speak of Jim himself, Fadus Calidius will tell you of his cave: "You heard of 'Goblin Jim's Cave'? It's a big one. It's a long walk due north of Skingrad, in the Imperial Reserve... a long way from civilization." He wears a pair of sack cloth pants and always carries a fine iron shortsword. From level six he will also carry another weapon: at first it will be either a dwarven shortsword or war axe; at level nine it may also be an elven shortsword or war axe, and from level 13 it can be a magic staff. He also has a small amount of gold. Goblin Jim spends all his time aimlessly wandering around Goblin Jim's Pantry, the third zone of his cave. If the White Skins succeed in recovering their totem staff and it's brought into the zone, he will run off and attempt to retrieve it. If the staff is successfully returned to its correct position in the stable-like building, Goblin Jim will restrict his aimless wandering to an area just around the building. If you can raise his disposition to 65 or above Jim will talk to you rather than attacking, but he only has the usual rumors rather than any meaningful dialogue. At the beginning of the game, the Totem Staff of the White Skin Tribe has been captured by the Sharp Tooth Tribe and can be found in Derelict Mine, in the second zone. Therefore, Jim will almost always default to his wider wander AI package. All the other goblin shamans have a script that sets the faction reaction between their tribe and you to 100 when they die. This causes all goblins in the tribe to cease attacking. Although Jim is a shaman, his script doesn't make this change, so the rest of his tribe keeps attacking.